Ivory tusks are displayed after being confiscated by Hong Kong Customs in Hong Kong, July 6, 2017. Hong Kong Customs seized about 7,200 kilograms of ivory tusks on July 4, 2017, from a container from Malaysia. Efforts by Thailand's government to curb sales of ivory have been successful, following criticism of widespread trafficking in the country, police said Friday. Police announced that since January, officials have seized two elephant tusks and 422 tusk fragments in a single case, while in all of last year they seized 99 tusks and 22 tusk fragments in multiple cases. Deputy Police Commissioner Gen. Chalermkiat Sriworakhan said the drop in the number of cases showed that strict enforcement had deterred traffickers. “We have made serious efforts to block elephant ivory from being smuggled into the country and sent on to another country,” Chalermkiat said, referring to past smuggling schemes. Now, “if they do get in the country, we do not let them leave,” he said. 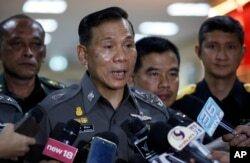 Deputy Police Commissioner Gen. Chalermkiat Sriworakhan talks to reporters at Royal Thai Police Headquarters in Bangkok, Thailand, July 7, 2017. Police in Thailand are claiming great success for a government policy to curb trafficking in ivory. Thailand had been considered to have the largest unregulated ivory market in the world and had been threatened with sanctions on the trade of protected wildlife species, but it introduced new laws and amendments in 2014 and 2015. The Elephant Ivory Act regulates the domestic ivory market and criminalizes the sale of African elephant ivory. The wildlife trade monitoring network TRAFFIC praised Thailand for a large drop in sales of ivory items resulting from the crackdown aimed at shedding the country's image as a center for the illicit trade in wildlife goods. Its survey of Bangkok markets found a decline in the amount of ivory openly for sale from a high of 7,421 items in 2014 to 283 products in June 2016. Measured over a slightly longer period of time, the drop was even more dramatic. In December 2013 the number of ivory items openly on sale was 14,512, according to earlier surveys by TRAFFIC. Poachers have killed tens of thousands of African elephants for their tusks to meet demand for ivory in Asia, putting the species at great risk. Thailand became a major transit hub and destination for smuggled tusks, which are often carved into tourist trinkets and ornaments. The biggest demand comes from China. Krishnasamy said illegal online trade is another part of the problem affecting Thailand. “Monitoring and enforcement of trade taking place online is extremely crucial to make sure that ivory items not on sale in the physical market haven't moved online,” she said.